Tocobaga The shallow mangrove-fringed waters of Tampa Bay abounded in fish, oysters, conchs, clams, and whelks and the oak and pine uplands nearby held a variety of game, including the white-tailed deer. Acorns, nuts, seeds, roots, and cabbage palm were there for the taking. This was an excellent place to be if you made your living by hunting, fishing, and gathering. Native peoples of Florida called the shores of Tampa Bay home for many thousands of years before the coming of the Europeans in the early 1500s. Here they lived in villages not far from the water’s edge, buried their dead in large mounds made of sand, and built tall pyramid-shaped mounds for their chiefs and priests from layers and layers of shell. When the Spanish conquistadores moved through this area of Florida they learned that these people were called the Tocobaga. The Tocobaga lived in separate villages around Tampa Bay and a short distance inland, each with their own burial and temple mounds. Some groups on the northern edge of Tocobaga territory grew corn, according to the hungry Spaniards, but this has not been archaeologically proven. 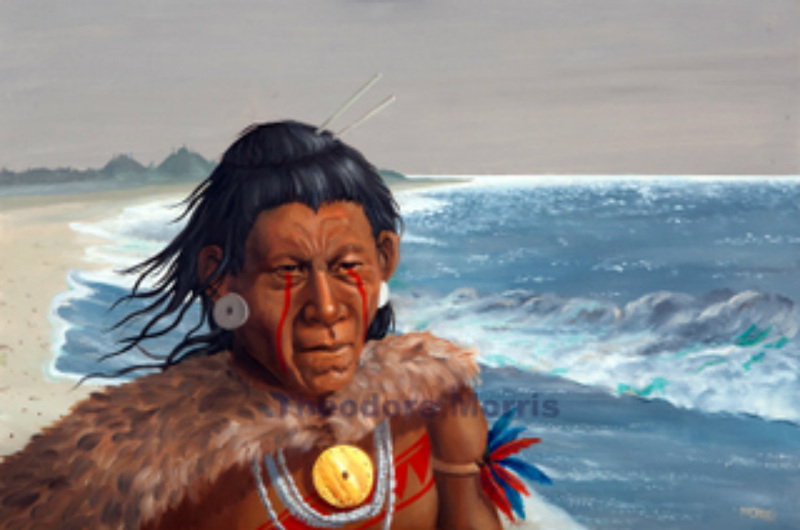 Tocobaga archers drew respect from the Europeans and they were feared warriors. Tribes up and down the coast and to the interior would feud with each other by raiding and taking captives. European goods salvaged from shipwrecks arrived even before the Spaniards themselves did, and European diseases might have done the same. We don’t know if the early European accounts of the Tocobaga describe a people already feeling the impact of contact or if they were living as their ancestors had for hundreds of years before. The Tocobaga consisted of small chiefdoms that at times battled each other. I painted this elder warrior with the ardent look of a person who has seen much bloodshed. 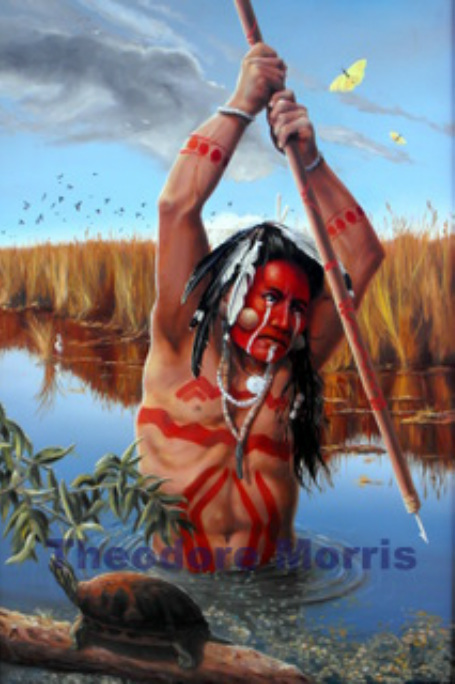 The cool water and gray sky contrasts with the warm colors of this warrior and infuses him with vibrancy. 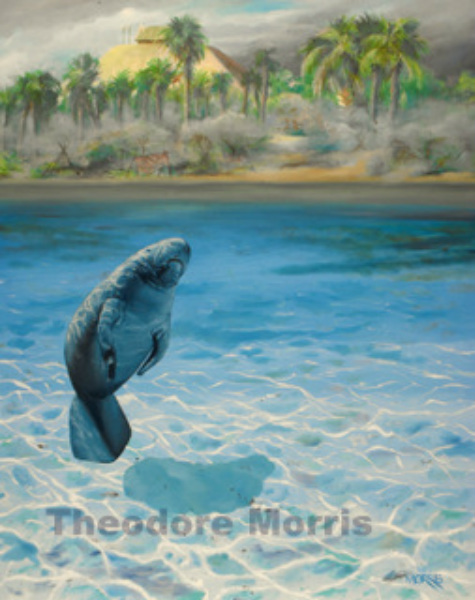 The Tocobaga hunted manatees for food. Manatees can exceed 3,500 pounds in weight and feed on plants growing in and along the fresh and salt waters in which they live. Villages were described by the Spanish as consisting of houses, built of timber, and covered with palm leaves. ﻿The Chief's council house stood near the beach, upon a high mound. In 1528 this Spanish soldier was captured by the Tocobaga tribe who lived around Tampa Bay. The head of the tribe, Chief Uzita, ordered that Ortiz be burned to death. His life was spared when Chief Uzita's daughter pleaded for his life. (the REAL Pocohantas story) She later helped him escape to another tribe. Ortiz stayed with different Indian groups until he was rescued by the Hernando deSoto expedition in 1539. Egret, Pelican, Cormorant and Bluejay feathers. In the misty morning hours a Tocobaga tribesman stalks his prey. The intricate tattoos indicate his tribal affiliation. The Tocobaga people around Tampa Bay fished, hunted and gathered food from their rich environment. Age may slow him down but it does not diminish his determination or pride. He wonders how his tribe will survive after devastating European diseases have devastated his people.I painted the vulture feather and dead and brittle wild grapevines in the background to reinforce his aura of concern. As with all cultures, the young must learn from the adults to survive in their world. The teacher looks out at the viewer as if waiting for a question. This Tocobaga maiden prepares herself for another day of work on the lower West Coast of Florida. She gathers clams and oysters from Tampa Bay for the midday meal. Her other duties are cleaning fish, preparing meat and hides of bear, deer, and other mammals that live in the area. She looks forward to the evening celebration where there will be dancing and feasting.